1. Heat the oil in a large heavy-based frying pan with a lid and cook the sausages for about 8 minutes until golden. Remove the sausages from the pan and set aside. 2. Add the onions to the pan and cook for 10 minutes until golden and wilted. Turn up the heat, add the flour and cook for just a minute then pour in the beer and bring to a gentle simmer. Add the mustard then return the sausages to the pan along with the chicken stock. 3. Simmer with the lid on for about 20 minutes then stir in the parsley. 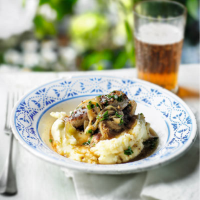 Serve over creamy mash with stir-fried cabbage.